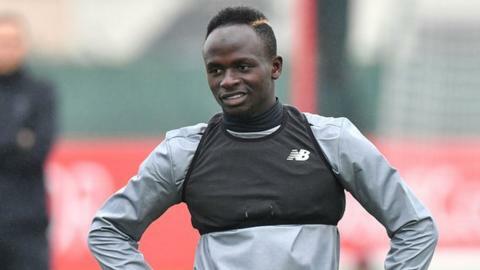 Liverpool forward Sadio Mane has been included in Senegal's squad for next month's World Cup qualifiers despite his existing hamstring strain. Mane had been an injury doubt for the home and away games against South Africa on 10 and 14 November. "In my mind there's no doubt he will be with us for the double header against South Africa and that he will be 100% fit," said Senegal coach Aliou Cisse. Liverpool said the forward could be out for up to six weeks on 10 October. Three days earlier, he had damaged his hamstring in the 2-0 win over Cape Verde in Praia and was substituted in the 89th minute. "Until now, he has just been doing some individual training - running in straight lines - but from next week, he is going to train harder and start working with the ball," added former Birmingham City midfielder Cisse. It is unclear when Mane will return to action, having already missed Liverpool's Premier League draw with Manchester United and the 7-0 thrashing of Maribor in the Champions League. Senegal, who reached the World Cup quarter-finals on their sole previous appearance in 2002, need two points from their remaining qualifiers to ensure their passage to next year's finals in Russia.